There is a tremendous demand for a powerful Security and Surveillance system for controlling ATM theft’s and fraud in the banking sector. Video Text Inserter adds a new level of security and control to your operations. 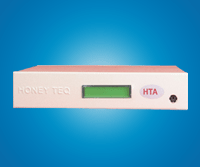 Honey Teq Automations designs & manufactures State of the Art ATM Interface equipment with specifications from Bank experts for remote monitoring of ATM’s. The VTI can also be used at Point of Sales terminals with few modifications as per unique requirements & specifications of the Customers. The Video Text Inserter provides a detailed record of every transaction made at the ATM. Transaction data is superimposed with the recorded video before the image is stored on the DVR. The transaction data may include Card Number, Time/Date, transaction type, function id, Transaction Amount & Bill Count. When a transaction is done customers data is linked from the ATM to the VTI and data’s of the customer is overlaid with a video image of the customer using the ATM. Suspicious transaction can be identified searching from the recording database. With every transaction being recorded onto a DVR, this low cost text inserter gives ATM owners the ultimate protection against credit card fraud, phantom withdrawal claims and disputed transaction can be identified searching from the recoding database. Text Area: 11 rows x 28 columns. Text can be placed anywhere on the Screen. Text Inserted Cannot be edited. Event Alert on Specific Text Input. 16 x 2 LCD display for Programming/ Configuration. Alarm Signal during input Video Failure. Real Time Clock (RTC) facility. Bank/ Branch/Date/Time display on Video. RS 232 interface / RS 485 / Ethernet. Order of Customer Data displayed as per Specifications. Input Voltage: 12 volts (0.7 A). Variable Baud Rate: 1200 to 38,400 bps.